Inground or Above Ground Pools? Summer is on it’s way! That means time out in the sun, warm Michigan weather, and if you’re lucky, time by the pool with friends and family! 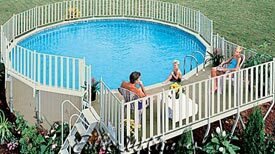 You might be weighing your options on what kind of inground or above ground pool you may want. Also, there are many options and things to consider along with what pool store in Michigan to purchase your pool from. There are above ground pools and inground pools, concrete and vinyl liners… it can be a lot to go over and decide, so let us help. The biggest thing most people consider when picking the proper pool for them is cost. The cost difference between an inground pool vs. an above ground pool is significant. With an inground pool you’ll not only be paying more upfront for the construction, but also in the long term as well. More chemicals, heating cost, more expensive repairs, it all adds up. Whereas above ground pools are a fraction of the cost for installation and long term care and maintenance. An above ground pool can be moved with you if you wish it to. Shorter installation time. You don’t want to have to draw out the process of getting a pool installed before you can use it. All inground pools take at the least two weeks to install, which can really put a damper on your summer. But for an above ground pool you can have your pool delivered to you and ready to go with in the same day. If this is your year to add an above ground pool to your Michigan summer activities let our pool experts at Viscount Pools help! Our Pool Stores run specials on our pools and pool equipment all year long so you can get the pool of your dreams! We’ll help you pick the right size pool for your backyard and all your needs. We’ve recently stocked up with some new pool suppliers you’ll love. Check them out here! Finally, call us today and check our local Michigan Pool Store Locations close to you.